Market your restaurant to dads in your area by offering them discounted prices on menu items when they dine with you on Father’s Day. Whether you offer half-priced drinks or a free dessert, a discount motivates families to celebrate the special day at your restaurant. Almost half of dads surveyed said they would prefer spending more time with family than receiving gifts on Father’s Day. Show dads the role your restaurant plays in bringing families together through promotional content on social media. 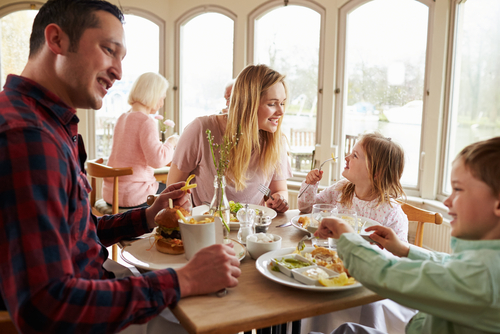 By appealing to dads’ softer sides and inviting them to share the holiday with your restaurant, you give them the quality time they are looking for. For many growing families, eating out can be more exhausting than enjoyable. This Father’s Day, ensure your restaurant is equipped to entertain kids of all ages at the table. By providing crayons and coloring books—or board games for those looking for more interactive fun—you give dads the ability to relax and unwind while the kids remain entertained and satisfied.